Thirty-two years ago Pati Ruiz Corzo and her young family embarked on a remarkable adventure and spiritual quest in Mexico’s Sierra Gorda, leaving behind their urbane life in Queretaro City. They have dedicated the intervening years to Grupo Ecológico—a not for profit collaborative that catalyzed the creation of the only Biosphere Reserve in Mexico which is governed locally. Grupo Ecológico has also helped put in place a variety of innovative funding mechanisms empowering a network of highly resourceful, impoverished small farmers and ranchers to assume the roles of preservationists and regenerators of their own land in one of the most biodiverse regions of the world. Pati tells their story here. Enjoy the sounds of the forests of Mexico while reading Pati's story. That day we decided we were ready to make a change. We took Mario and his brother, Roberto, out of school, and our family went to the ranch house in Sierra Gorda where my husband had been born and where his own father, Erasmo, was born in 1916. We built a cabin there and we decided we were ready to begin a new life. We burnt our bridges in every sense. I was a size seven at that time, I had been wearing makeup and high heels, and my friends were all shocked when I left and began this simple life. In our new home, we dedicated many hours in the day to educating our children. Their school was the forest. They learned to love learning but completely out of formal school. They grew up gifted in many ways, with many skills. It was a wonderful experience to live by ourselves—cooking fires, practicing homeopathy and naturopathic remedies, and just living life—trying to get more healthy as a family as our objective. Every day we breathed the wonderful prana, rode horses, and grew beautiful organic vegetables. 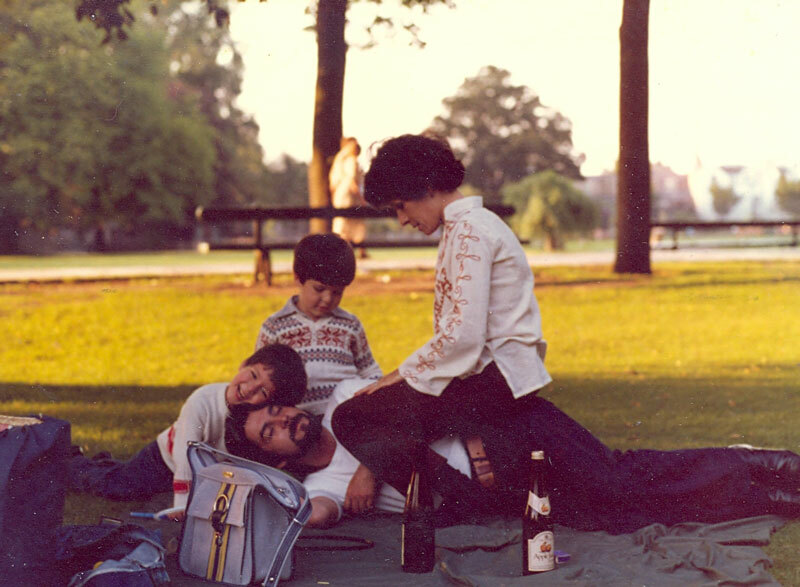 We discovered, the four of us, how much the simple life makes for deep family satisfaction. Gradually I realized that I came to Sierra Gorda to take care of nature. I fell in love with Mother Earth. Leer la traducción al español de la historia en este enlace. 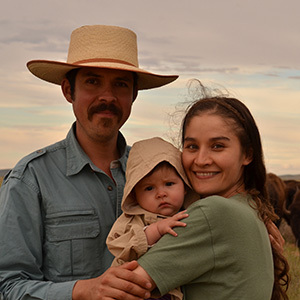 Read the story of Grupo Ecologico’s Mario David Pedraza, who works with Sierra Gorda farmers and ranchers to reconnect them with the culture of their native soil, regenerate their land and enrich their lives through the practice of permaculture and holistic management. that I was taking care of something you could call divine. My children are now 39 and 37, and Roberto and I, we are all still together in this dream we have had for 27 years. We began Grupo Ecológico Sierra Gorda in 1987 and it began with a gathering of cousins and aunts and sisters-in-law. Roberto’s family is big in Sierra Gorda and well rooted here. Then more local members joined, and we began a wave of activities. We are so committed to taking care of this territory and we now have many more very committed members on our team, undertaking on a daily basis, with persistent faith, a big project, operating on a million acres and in 638 communities. We all know the emergency we are in. We understand that Sierra Gorda is a wonderful green island of life surrounded by this dark present. We are really scared of the social and environmental disaster that is coming. We want to think that in this crucial moment in time something better has to start. It is our opportunity to bring all our spiritual values into the game. We know we have to connect two worlds. We have had this wonderful opportunity to live in the forest and learn how to be self-sufficient and to have great joy in living with little. But we also know we need to protect every stream and every sacred forest. We need to stop the illegal logging and the agricultural practices where we are overgrazing livestock on rocky, steep slopes until there is no more vegetation, and then planting corn fields on that barren ground, causing us to lose millions of tons of soil. to address the way we are destroying the land. In May 2014 we celebrated the seventeenth anniversary of the official government decree making Sierra Gorda—an area representing 32 percent of the state territory—a Biosphere Reserve. It was the culmination of Grupo Ecológico´s work in the five northern counties of Queretaro over the first ten years, carrying out environmental education in the preschools through secondary schools, partnering with local authorities on solid waste management, and reforestations with landowners in the upper watersheds. Through these activities we mobilized a powerful civil conservation movement. The Sierra Gorda Biosphere Reserve is a unique experiment. We are now not only a federally protected area (FPA), we are the only biosphere reserve in Mexico with a participatory model for civil society management. Instead of bureaucrats or biologists from outside the region being brought in to manage our affairs, President Zedillo changed the normal FPA protocol by appointing a Biosphere Reserve director from local leadership. I was the first of those directors creating a synergy between the local civil movement and the federal decree (appointed by our then president Dr. Ernesto Zedillo). I was a public servant for fourteen years in that role, with the Reserve part of the National Commission of Natural Protected Areas (CONANP) of the Ministry of Environment and Natural Resources (SEMARNAT). Here in Sierra Gorda the people now know that they live in a biosphere reserve and so do the county mayors (our municipal presidents). We do everything to restore, regenerate, to compensate, to make it happen, to love. It has been a strategic opportunity for this territory. We got what we wanted, to have a management program that we could use to defend the territory, to have environmental regulations that could be enforced, and to be able to say, “no, you cannot build your dam or your electricity line here.” You don’t know how many times it has given us the legal framework to defend the territory. Grupo Ecológico manages three environmental education programs: ecological youth, community environmental education, and fundraising. We have been reaching 17,000 kids every year for over 15 years in a constant movement around 170 schools. We also provide training and didactic materials to a large network of environmental educators. Part of this mobilization includes 50 Earth Festivals in 50 communities every year, involving authorities, families, and students from the smaller neighboring communities. Grupo Ecológico environmental ecological youth program has been visiting 170 schools and reaching 17,000 children every year for the past 15 years. good will and a sense of rootedness here in this place. For the last 15 years we have helped organize recycling in 113 communities with recycling centers, all managed by volunteers—wonderful, committed, precious ladies that have been taking care of these activities for decades. Two years after the Biosphere Reserve was decreed in 1997, a book of the federally approved regulations known as the Federal Management Plan was published in the Diario Oficial de la Federación. The Management Plan is a wonderful document that has been our compass since then. It was the book of all my dreams, but with no money to fund those dreams. So we had to find funding to make the Federal Management Plan real. In 2001 Grupo Ecológico got approval to be a full-sized Global Environment Facility for a period of eight years, administered by the United Nations Development Programme and operated by the National Commission for Protected Areas. Under the plan for the project, we were to create economic value and be paid for it by acquiring new skills for the protection of our ecosystems, to preserve its natural beauty and scenic value, and its ecosystem services. We planted and planted seeds of change. We began creating a different image of ecotourism. And with the local community enterprising women built eco-lodges, and improved the appearance and service of the roadside family-run restaurants using a traditional clay technique. We now have 83 eco-destinations operating in the Reserve. Since 1996, Grupo Ecológico has worked tirelessly with many international experts and organizations to create innovative protocols (including a unique protocol developed with the State of Queretaro) that allow landowners living in extreme poverty to become true stewards of their land by compensating them for their ecosystem services. Programs like Premium Carbon, Solidarity Carbon, and Biodiversity Carbon are among the mechanisms that have provided funding for the extraordinary land conservation and reclamation work that has occurred in the Sierra Gorda over the past 20 years. but now they have a new opportunity, and there is an entrepreneurial spirit you can touch. We have wonderful meetings where we share information and training. These entrepreneurs are implementing a Model for Rural Tourism in a Natural Protected Area with a local standard known as the “Sello Sabino Cypress Seal).” Sierra Gorda was also designated as one of 13 Early Adopters of the Sustainable Destinations Criteria created by the United Nations World Tourism Organization (UNWTO). From the beginning of all of our work our objective was to regenerate the forest cover on the land and with the federal regulations of the Biosphere Reserve in place, we could finally enforce the avoidance of land use change. Since the federal decree of the Biosphere in 1997, the owners of 13 thousand hectares of land that were once cultivated or grazed to degradation were left to regrow from old forest seed fall and therefore were thus protected from land use change. Now that the forest has an economic value, the people who live on the land take care of it. It is great that they are now recognized as ecosystem services providers and they no longer let forest fires begin as they did in the past. for how to raise livestock and still regenerate the land. Then my younger son, Mario, who is devoted to soils and is a self-didact, found the right teachers to answer that question. He had earlier brought to our Earth Center Training Center (Centro Tierra), the Australian permaculturist organization Regrarians, led by Darren Doherty, who taught us the techniques for hydrological landscaping known as Keyline Design. Over the past eight years since then many others, including Más Humus, have come to teach us how to remineralize the soil, to prepare biofertilizers, and to strengthen the infiltration of water. Now we are producing beautiful organic food, and conducting lots of training and microworkshops led by the staff of Bosque Sustentable A.C. an independent non-profit created in 2001 by Grupo Ecológico to work with landowners with wood and non-wood resources. I returned to the directorship of Grupo Ecológico Sierra Gorda six years ago, after serving as federal director of our Biosphere Reserve for 14 years. It was great to be the “sheriff” of the region, but as a member of civil society I move again at my own speed, I am again in my own element, and I have many ways to make things happen. We are trying to raise this work to a national level, and we have a national strategy. For example, we are pushing for an ecologic livestock program at the national level with the Ministry of Agriculture (known as SAGARPA) by leveraging the capacity of the four Savory Hubs in Sonora, Coahuila and Chihuahua, and we plan to train 45 educators yearly. We are also nurturing civil participation from the bottom up, and it is beginning to scale beyond our local realm. Ninety seven percent of the people of the Sierra Gorda Reserve territory are in extreme poverty, but because we have worked so hard to raise awareness, build consensus, and organize, these people are setting an example of local decision-making, and the empowerment they have experienced has resonated up the ranks; most notably the creation by our federal government of our Biosphere Reserve. Many students and professionals visit our training center, Centro Tierra in Jalpan de Serra, the main town in the heart of the Biosphere Reserve. With the Sierra Gorda as a living laboratory, our workshops educate policymakers, legislators, and primary producers about the tools and methods for everything from soil cultivation to carbon capture. We also provide an online diploma course, “Teaching and Learning for a Sustainable Future,” based on UNESCO materials released at the 2002 Earth Summit. We also offer fundraising training workshops for beginners. Sierra Gorda is a model that is replicating its strategic lines of work, setting precedents on a national level for civil society organizations to enable them to gain consensus and fundraise, and to provide effective answers for conservation of ecosystem services and for fighting poverty. We are a team working to mitigate climate change and strengthen regional resilience by protecting the biodiverse forests in the upper parts of the watershed and downstream by instilling agro-livestock practices that capture water and carbon and produce organic foods. We organize clean up campaigns and construct water treatment plants, practice community tourism—and it is all wrapped up in the environmental education program that creates a bond between the territory and the region responsible for it. Without a doubt Sierra Gorda is raising a wave of love for the planet. Short film directed by Yann Arthus-Bertrand, produced by Jean-Louis Remilleux and the European Production Society.